People face adversity and tragedy in different ways. Some retreat from the world. Some lash out at the world. Others like Kraig, refuse to be conquered. Kraig served our country as a member of our armed forces. Like so many of his brothers and sisters in arms, Kraig came home with some wounds that no medication could heal. The emotional scars he bears are beyond what most people can ever truly comprehend. The physical toll that his service took is immense. Kraig suffers from Parkinson’s disease brought on at least in part, by the head trauma he endured in combat. Parkinson’s is a vicious and cruel disease that attacks every part of a person’s body. Luckily for the world however, the disease has left Kraig’s spirit untouched. In search of a service dog, Kraig decided to head to Palm Valley Animal Center (PVAC). There, he crossed paths with Claire. 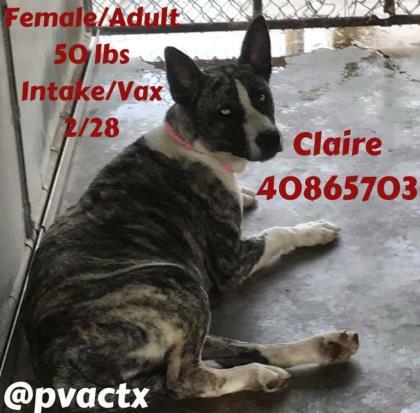 Claire was brought to PVAC as a stray by Hidalgo County Animal Control on February 28, 2019. She wandered the streets of rural Hidalgo County exposed to the intense South Texas heat and sudden and violent thunderstorms. When she arrived at PVAC, our medical intake team vaccinated and assessed her. After about a week Claire began showing signs of pregnancy, and her records were updated accordingly. For weeks, our staff gave her food, water, and affection. For weeks, Claire stayed in our kennels waiting for a second chance at a life full of love and warmth. 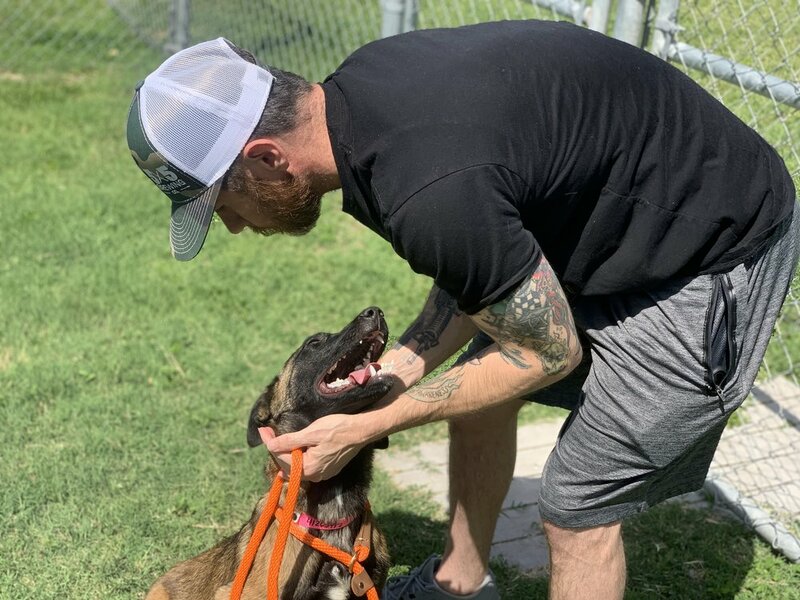 On April 6, 2019, Kraig saw Claire and knew he wanted to take her home. On Sunday April 7, Claire went home with Kraig. When Claire was adopted, she had a cough and we suspected she was pregnant. The following day Kraig returned to the shelter to have Claire examined. He was concerned about her health as she had begun to experience a worsened cough, labored breathing, and green nasal discharge, and seizures. Kraig then made the difficult decision to return Claire to PVAC. It is very difficult to separate ourselves from the endless urgency of the work we do here at PVAC. The constant stream of homeless animals that floods our shelter daily is maddening and it takes immense strength for our staff to keep their footing. That flood can easily sweep pieces of ourselves far away if we are not vigilant. When Claire was returned to PVAC, it seems that empathy had been swept far out to sea. Whenever people come to PVAC to turn in a stray, or to surrender their own pet, we are asked: “he’ll get adopted right?” or “she’ll find a home right?” The hard truth is that we are simply not in a position to guarantee a live outcome for all the pets in our care. Although the animals here in our kennels have a better chance at life than ever before in PVAC’s history, there are still many miles left on our journey to no kill. It is our responsibility to make that abundantly clear to people surrendering animals to our shelter. There is a difference between stating the facts about our shelter to a person, and making sure that person truly grasps the reality of those facts. Since we live that reality every day as employees, it sometimes feels impossible to comprehend that most of the public simply does not know the urgency of our shelter’s situation. When a person like Kraig, who is already distraught by the ordeal of having to give up a pet, comes to PVAC to return an animal, it is even more imperative that we clearly communicate the risks involved. When Claire was returned to PVAC, we failed to communicate clearly. We failed Kraig. Distemper presents a very real danger to all dogs in our facility. Distemper is especially hazardous due to the fact that it is airborne. If any dog shows symptoms that could be indicative of distemper, that dog has to be treated as an immediate threat to all other dogs in our shelter. The unfortunate reality is that the symptoms of distemper could just as easily be signs of non life threatening issues, but we do not have the luxury of being able to medicate for it. We do not have the space to house animals showing symptoms of distemper. Distemper is far too dangerous for a shelter like ours to risk. There is currently no test akin to SNAPP tests for detecting distemper. The tests that are available for distemper are costly and slow in returning results. Distemper is the ultimate fear here at PVAC. Common symptoms include but are not limited to, cough, green nasal discharge, green eye discharge, muscle spasms, and seizures. When Claire was returned to PVAC, her health was very poor. Her breathing was so labored and her nasal discharge so advanced that our veterinarian made the decision that Claire should be euthanized for mercy. Even if her breathing had not been as labored, her green nasal discharge pointed to the ultimate fear in our facility: distemper. On Monday April 8, 2019, at 5:49PM, Claire was euthanized. Claire’s fate was what tens of thousands of animals in overburdened shelters face every year. In 2018, PVAC euthanized 12,383 cats and dogs. PVAC is fighting every day to increase our lifesaving rate. Our ultimate goal is to achieve no kill and we have no doubt that we will get there eventually. From May 2018 to March of 2019, PVAC euthanized 6,848 fewer animals than the same time period in the year prior. That is a 40% decrease in the amount of euthanasia taking place at the shelter. From January 1, 2019 to today April 12, 2019 we have saved 65% of the animals entering our facility. What is it like to have to euthanize? As Kraig put it, the news of Claire’s fate felt “like losing a battle buddy.” Such a heartbreaking experience would shake the resolve of most people, but not Kraig. Just a few days after losing Claire, Kraig came back to PVAC to meet Nicky. Nicky was brought to PVAC by good samaritans who found her wandering the streets of Edinburg. She was shy at first, but once Kraig carried her away from the noise and activity of the dog kennels, Nicky’s true personality began to emerge. Belgian Malinois are great working dogs serving alongside law enforcement agencies all over our country. Kraig plans on getting Nicky trained as his service dog. This coming week, Nicky’s fitness for service training will be evaluated by Train A Dog Save A Warrior. The training will be tough, but Kraig and Nicky will hopefully face those hurdles together. Meeting Kraig was a moving experience. His unflinching positivity and ability to move forward from adversity and tragedy with an open heart is incredibly motivating. Rather than retreating from or lashing out at the world, Kraig faces it with an unconquerable spirit. After being moved by Kraig’s perseverance, the Director of Operations at PVAC asked if Kraig would be open to sharing his story with the entire PVAC/PAWS staff. Kraig has graciously agreed and will be speaking to our staff later this month. When we discussed writing this story, Kraig suggested using this blog as a platform to spread awareness of Parkinson’s Disease. April is Parkinson’s Awareness Month, and nearly 10 million people live with this often misunderstood disease. Kraig is a warrior, a survivor, and an advocate. Below are some links that Kraig wanted us to share with the public. In October 2018, distemper tests were taken while animals were still on animal control trucks. 3 out of 7 dogs tested positive for distemper and presented with no symptoms. Distemper is in our community and we need our community's help in keeping pets healthy. Distemper is preventable, and we urge our community to please contact their local vet to learn more. Listed below are a few local options for veterinary services.